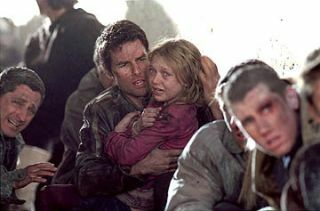 Tom Cruise and Dakota Fanning take shelter in "War of the Worlds," a 2005 update of H.G. Wells' 1898 novel of war between aliens and humanity. Credit and Copyright: Paramount Pictures/DreamWorks Pictures. FilmmakerSteven Spielberg's update of the science fiction classic War of the Worlds,may be a popcorn adventure at heart, but its fight against invaders hits closeto home. The modernversion of science fiction writer H.G. Wells' 1898 classic novel, which pits anunsuspecting public against an unstoppable attack force from Mars, calls onterrorism fears to spread its message of survival and determination. Withexplosions galore - bring earplugs, you'll need them - and violence that neverresorts to gore, Spielberg presents a stunning depiction of surprised alien aggressionand humanity's seemingly ineffective defense. War ofthe Worlds, whichopens in theaters today, follows blundering father Ray Ferrier (Tom Cruise) ashe bears witness to the destruction of humanity at the hands - or tentacles -of towering, three-legged machines. He also must keep his daughter Rachel(Dakota Fanning) and defiant son Robbie (Justin Chatwin) alive on the harrowingtrip between their Newark, New Jersey home and Boston, where safety supposedlyawaits. Telling astory of interplanetary war through the perception of one character harks backto Wells' original story, which relates Martian aggression as witnessed by asingle protagonist who, himself, is trying only to reach his wife. Cruise'sstill-boyish charm allows the portrayal of Ray to move beyond simple actionhero status to that of caring and - eventually - responsible father. But unlikemost modern disaster films, Spielberg's Worlds goes refreshingly easy onmajor landmarks (there isn't a dog either, which I used to believe ubiquitous insuch films), without sparing the battles. Asexpected, the film's special effects don't disappoint, and combine the pulpyallure of the tentacled, ray gun-toting Martian tripods in Wells' novel withthe sleek look of a modern - albeit alien - war juggernaut. Worlds is darker than Spielberg's previousstints with alien visitors, among them 1982's E.T: The Extraterrestrialand 1977's Close Encounters of the Third Kind. But then Wells' aliensaren't the sympathy-craving kind, even if they are 107 years old. Despite itsdark overtones, and liberties taken with Wells' source material byscreenwriters Josh Friedman and David Koepp, Spielberg inlays his take on Worldswith several fun gems that fans of the original text and the George Pal/ByronHaskin 1953 film version can appreciate. In one, theearth slowly unscrews to unleash alien war machines. Later, a suitably creepyTim Robbins (Mystic River) appears as Ogilvy, a basement-bound survivorwhose plans for a resistance are a far departure from those of ill-fatedastronomer of the same name depicted in Wells' written tale. The faithfulfinale of War of the Worlds may fall flat for strangers to Wells' story(a population which shockingly includes my lovely wife), despite its manyappearances in book, radio, television, film and - yes - rock operaincarnations. ButSpielberg offers a new notch in Wells' legacy, and a refreshing revisit tointerplanetary war. (War ofthe Worlds opens June 29. Running time: 112 minutes, PG-13).